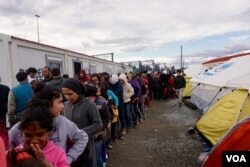 They have been at Idomeni for ten days. And if the border isn’t opened what then? “We have nothing," she said. "I don’t know what will happen to us.” She wants to join another daughter who is in Holland. The refugees display a protectiveness towards each other — including strangers. A small girl who couldn't find her tent and burst into tears near a food queue immediately had people bustling around to assist her. Shortly after, an old, wrinkled Iraqi woman rose to embrace several journalists she saw enter the collective tent she was in — her way of thanking them for chronicling the story of the refugees at Idomeni. A local (L) offers migrants who are making their way to the Greek-Macedonian border something to eat, at the Greek village of Idomeni, Greece, March 5, 2016. 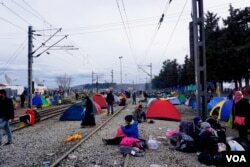 Migrants have been pouring into Greece, such as the northern town of Idomeni, near the border with Macedonia. They're weary, and often hungry and cold, too. Most of all, they're anxious about whether and when they can make progress toward a more stable life in Europe. Photos by Jamie Dettmer for VOA.